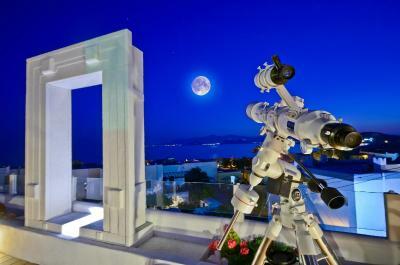 Lock in a great price for Naxos Island Hotel – rated 9 by recent guests! The staff are so kind and helpful, they couldn't do enough for you. Our room was lovely, good size and very comfortable bed. 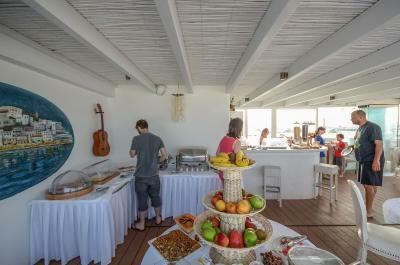 Meals are served on the rooftop overlooking the beach and surrounding area. 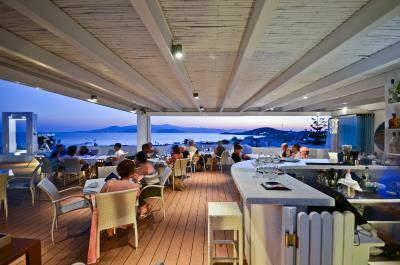 Stunning sunset views.. Breakfast is good, lots of choice. 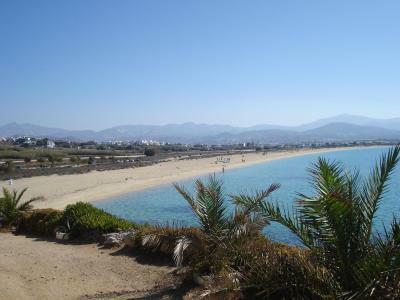 Close to the beach, shops, restaurants, bus stop. Would definitely return. 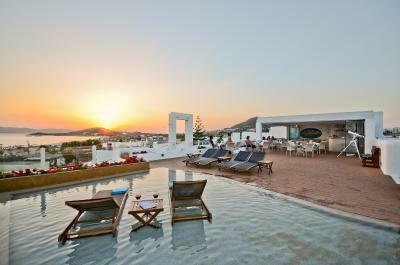 This hotel is the perfect place to stay in Naxos. Right from the pick up at the port to the day we checked out it was perfect. We didn’t want to leave. Beautiful hotel. The best staff. Amazing experience. We will be back! Everything about this hotel was great! 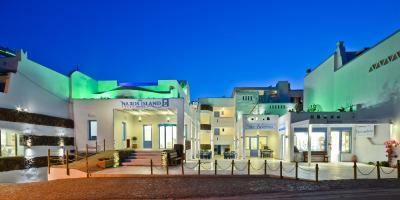 Staff, rooms, breakfast & location! Will definitely go back. Great location. Steps to a beautiful, sandy beach. We had a room with private jacuzzi. The view, however, from the rooftop restaurant is the best in town. Many, many restaurants in easy walking distance. Fabulous staff and service. 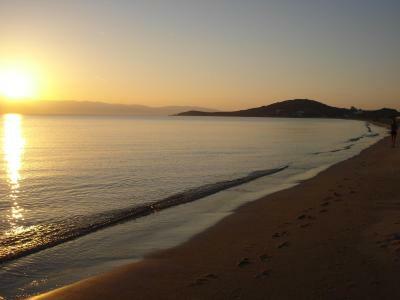 Naxos is a beautiful island - definetly going back. The manager was so personable and helpful. 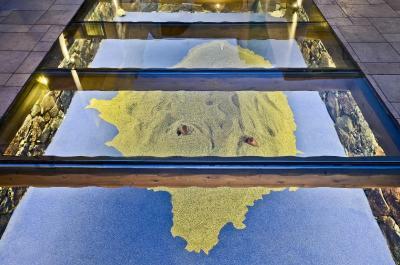 The location is perfect for spending a day at the beach or taking a bus to the Old Port Town. Would have loved to have had more time here, the beach was so relaxing and beautiful. Awesome hotel with a wonderful staff!!! Great rooftop restaurant. Great breakfasts. Modern rooms and very clean. Complimentary beach umbrellas and towels. Friendly staff that care about customer happiness. Great location. The location was great! The staff very friendly and accommodating. The pool was just ok but it was so close to the beach that we didn't spend time at the pool at all. My only suggestion would be for them to add a light blanket for sleeping. They only had a set of sheets for sleeping and while they were very nice and very clean I did get a little chilly at night. Im sure they would have brought one if I had asked but I didn't. Electric bed and toilet were so much fun! Heated jacuzzi in our terrace was luxurious. Amazing breakfast. 2 minute walk to the beach. Hotel staff was amazing and very friendly. The hotel manager clearly loves his job and he certainly is the fifth star to this hotel! The staff was very helpful and friendly, the service they provided was great, they had an awesome included breakfast that you could order the night before and pick the time and location (pool or room) you wanted to have it, and the property was clean and nice. 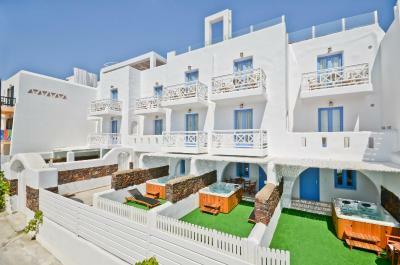 It had a view of the Sea, it was only a few minute walk to the beach, and there were plenty of restaurants nearby. 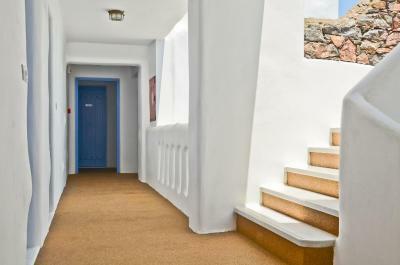 Naxos Island Hotel This rating is a reflection of how the property compares to the industry standard when it comes to price, facilities and services available. It's based on a self-evaluation by the property. Use this rating to help choose your stay! 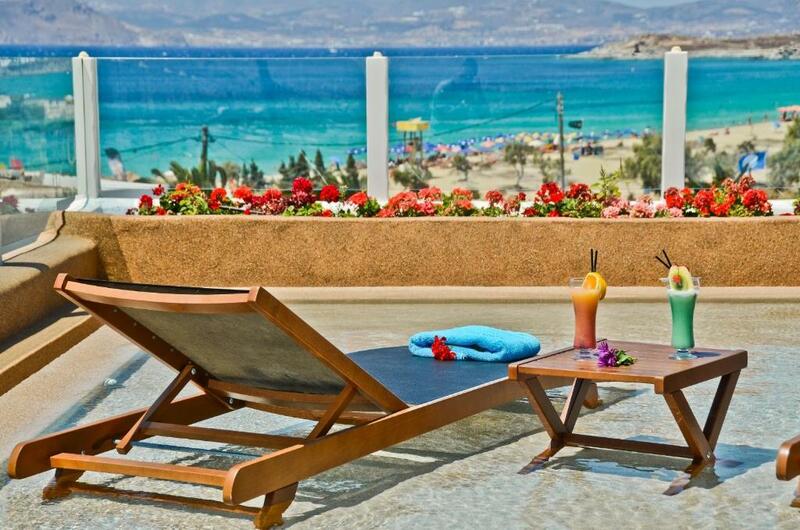 Just a few feet from Agios Prokopios Beach, the 5-star Naxos Island Hotel features a rooftop pool with a restaurant, enjoying panoramic views of the Aegean Sea. 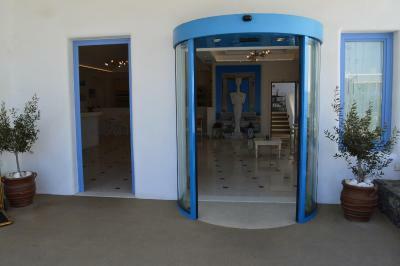 It offers a wellness center with hot tub and free Wi-Fi throughout. The elegant air-conditioned rooms offer a comfortable adjustable bed, flat-screen Smart TV with satellite channels and mini-bar. Some open to a balcony with nice views, while others have an outdoor hot tub. 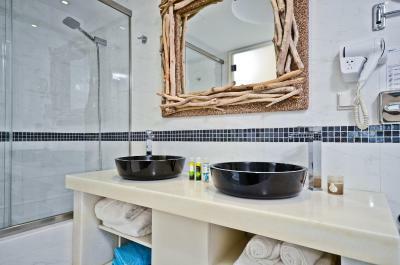 Bathrobes, free toiletries, an electric toilet and hairdryer are featured in the modern bathroom. Free use of the mini-bar is offered. 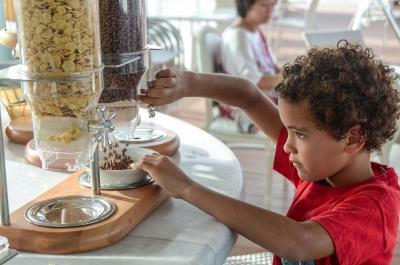 Guests can order meals, snacks and drinks at the rooftop "The Taverna" restaurant. 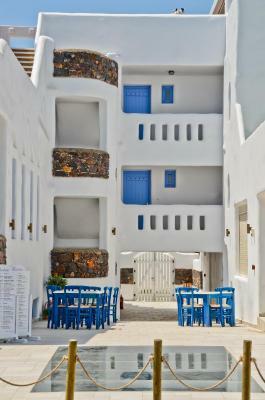 The Cycladic-style Taverna of Naxos Island serves buffet breakfast and Greek dishes, during lunch and dinner time. 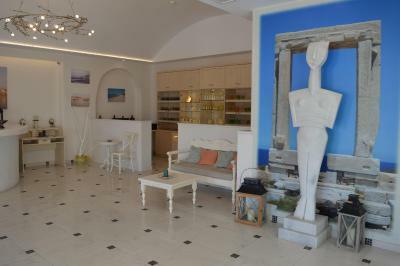 The spa center consists of a hot tub, hamam, sauna, hydromassage and 2 rooms for massage treatments. 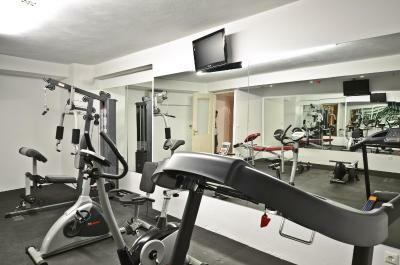 Facilities also include a fully equipped gym and hairdresser salon. Free beach and pool towels are available, while guests are also offered a welcome drink and a souvenir gift. 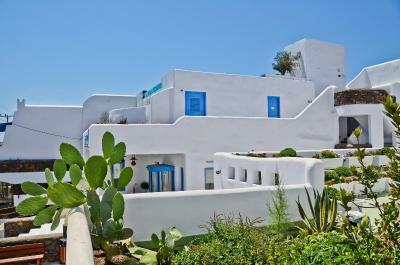 Naxos Island Hotel lies around 1.9 mi from Naxos Airport and 3.1 mi from Naxos Port. 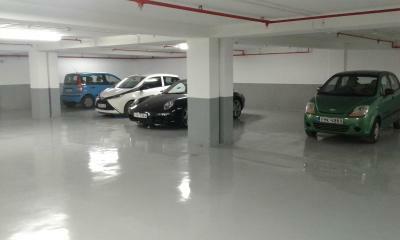 Free, private parking is available on site. 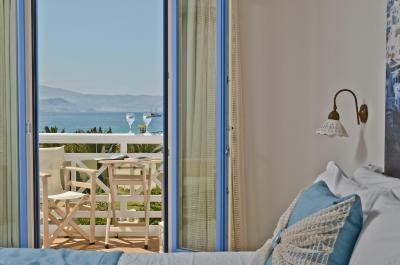 When would you like to stay at Naxos Island Hotel? Featuring modern décor, this air-conditioned room features electric adjustable beds, a flat-screen satellite TV and a mini-bar. Some open to a side sea-view balcony. Bathrobes, free toiletries and a hairdryer are offered. 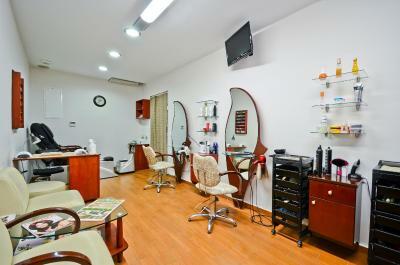 - 1 haircut or 1 manicure at the hair salon of the hotel. Elegant air-conditioned room offering flat-screen TV with satellite channels, free mini-bar and balcony with partial view to the sea. Bathrobes, free toiletries, an electric toilet and hairdryer are featured in the modern bathroom. 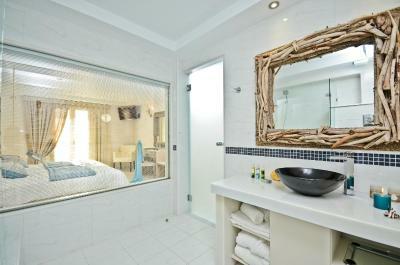 Elegant, air-conditioned room with exterior hot tub, offering a flat-screen TV with satellite channels, a mini-bar and private veranda. Bathrobes, free toiletries, an electric toilet and hairdryer are featured in the modern bathroom. Elegant family unit features a private veranda and exterior hot tub. 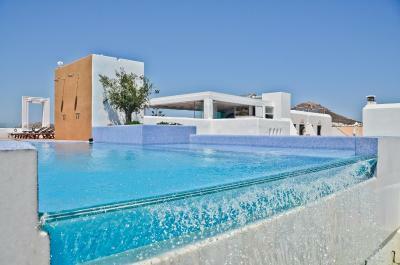 It offers a flat-screen TV with satellite channels and mini-bar. Bathrobes, free toiletries, an electric toilet and hairdryer are featured in the modern bathroom. 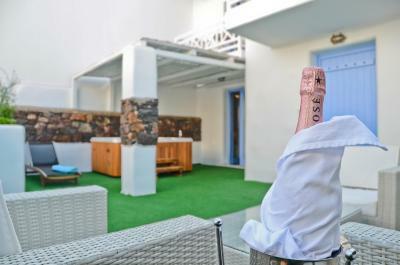 House Rules Naxos Island Hotel takes special requests – add in the next step! 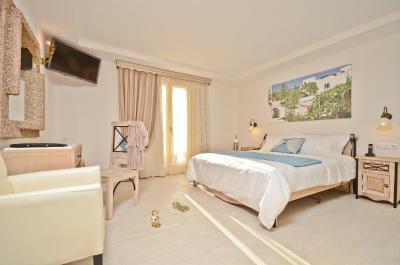 One child from 3 to 12 years is charged EUR 25 per person per night in an extra bed. 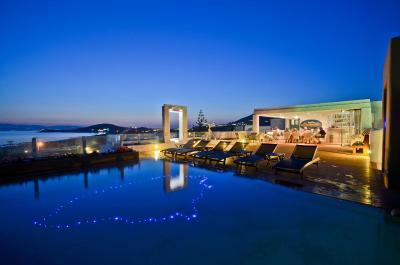 Naxos Island Hotel accepts these cards and reserves the right to temporarily hold an amount prior to arrival. 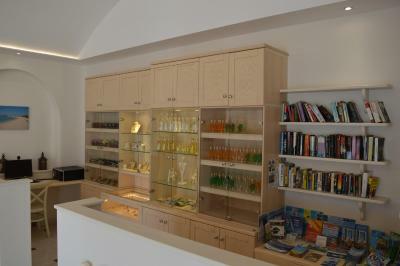 -free use of mini bar in the room. 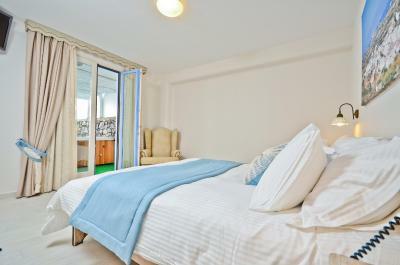 The rooms are not extremely soundproofed, when you have soft sleep.. 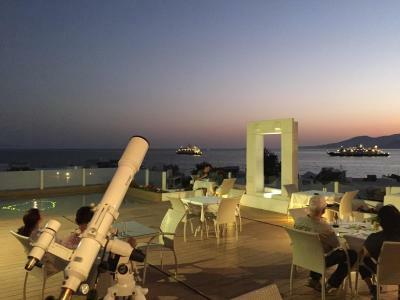 The Hotel is not just next to the prettiest beach on the island it also has a rooftop restaurant/ bar/ pool with a beautiful view (for the sunset). 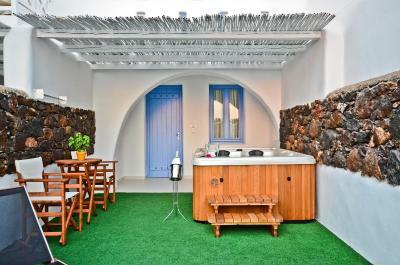 The staff is friendly, really helpful and has great English as well as great knowledge about the island to inform or help you.. the rooms are new and in greek style designed. I truly recommend that hotel and my husband and I will definitely come back. Everything !! Fantastic hotel , fantastic service !! I will definitely be back here again ! 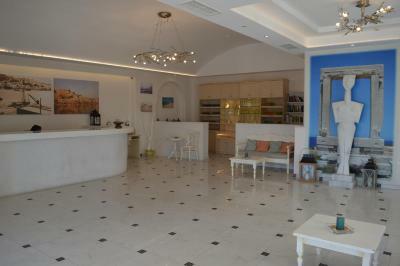 NICE FRIENDLY FACILITY WITH EXCELLENT BEACH NEXT TO HOTEL. HOTEL ROOMS NICE AND SPACIOUS. NICE RESTARUNTS AROUND FACILITY.GREAT BREAKFAST. GOOD POOL. EXCELLENT FRONT DESK STAFF. 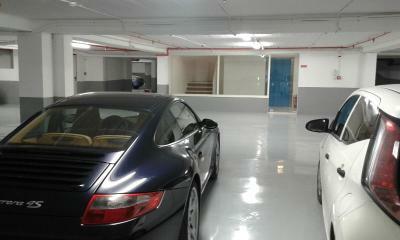 VERY EFFICIENT TRANSFERS TO AND FROM FERRY AT REASONABLE COST. Hotel amenities: -Beachtowels only available per request. You have to ask for fresh ones everyday. It is not like they are always readily available at the poolarea. -Sunchairs at the poolarea are a tad bid old/uncomfortable. Spa area (which belongs to the Hotel, but is manned by an outside nailing/spa/beauty salon): - sauna only available per extra surcharge. -Couples massage not available due to lack of employees at hand. -Many other massage types simply not available. -Also pricing policy very complicated. 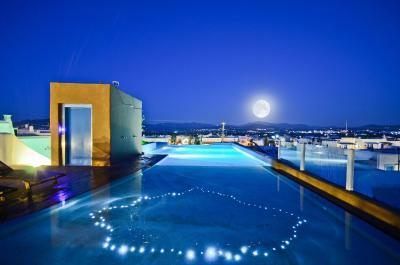 -The view from the poolside area on the rooftop. -Unobstructed amazing sunsets to be witnessed. -The food. -The breakfast buffet each morning. 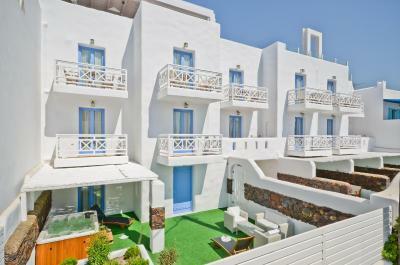 there was a problem with the payment, since my initial card was not accepted by the site of the hotel (although it was a Greek card, valid for internet transactions), and I lost the room availability until the transfer was made to the second card. But finally someone cancelled and managed to book the room I wanted. as for the room itself, I would have liked to have more natural light (we had the ground floor room with the Jacuzzi), since there were times when we had to open the door in order to have some light. but i guess the Jacuzzi was worth this sacrifice. the staff was very client-oriented. very friendly and willing to answer promptly to every request. the bed was very comfortable: usually I need to accommodate sleeping in a new bed, but from the first night I did not have any problems. I really appreciated that fact that the room was cleaned every day, as well as the Jacuzzi. the food was amazing: a large variety of sea food choices for lunch as well as other delicacies, breakfast was very filling with a wide choice as well. the hotel was very close to the beach, souvenir shops, ATM, and the view from the restaurant was amazing! From Vagelis' gracious welcome to Alex's right on suggestions and help, staff made us feel as if at home. 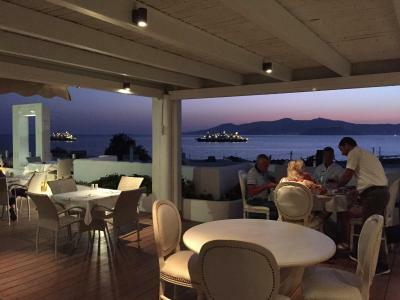 Great restaurants abound and the beach at Agia Prokopis is 5star. Lots to do so Location is perfect too. 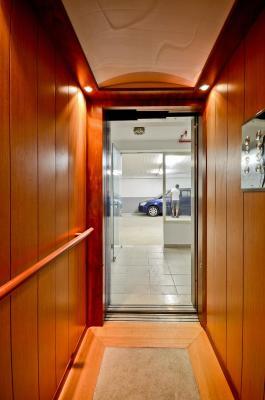 2 mins walking distance to the beach. Location is just perfect. Bus stop next to hotel so convenient to the old town and Plaka beach area. 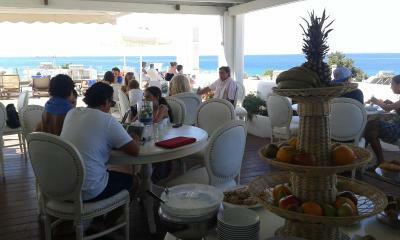 Very friendly staffs, simple but good breakfast on the roof top restaurant with great beach view. 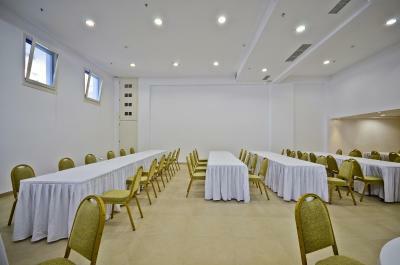 The staff was very friendly and the room was clean. 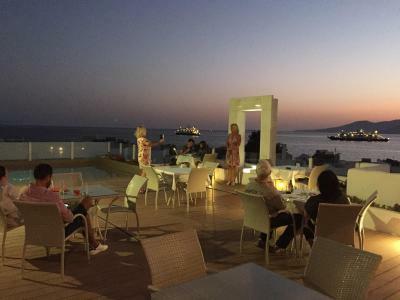 They had a lovely restaurant at the top of the hotel that looked at the sea which was beautiful. The hotel was a few minute walk from the beach front. Excellent vacation spot for couples and families.